This series presents the bird life of different habitats in the British Isles to outline how birds are adapted to the environments they inhabit and how these environments shape the birds' behaviour and breeding patterns. 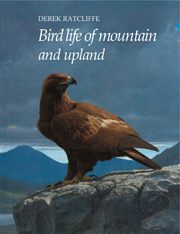 It thus presents a new, ecologically oriented approach to understanding the bird life of Britain and Ireland. Books will be illustrated by many specially commissioned line drawings and will feature photographs of birds and their natural habitats. They will be of interest to the keen ornithologist and anyone interested in the conservation and natural history of the British Isles.